This is another adaptation of my standard cookie recipe, which I love for many reasons. Not the least of which, because it is a wonderful reminder of the many years we baked this recipe for our Christmas cookies. It bakes beautifully and it is easy to adapt to your particular needs (even gluten free). I have made cookies & cream macarons in the past, but hadn’t made a cookies and cream type of cookie that I could ice and decorate until now. 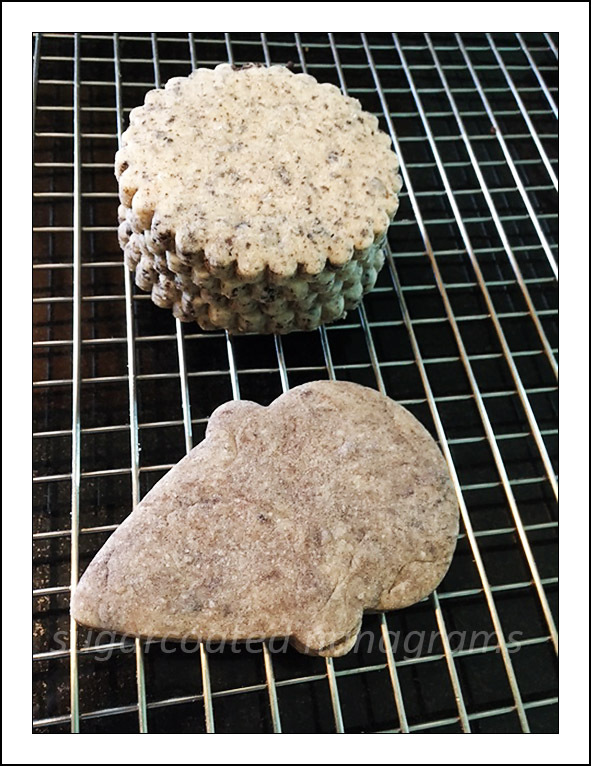 Although I made them a few weeks ago, I wanted to get my “official taste testers” (otherwise known as my fabulous grandchildren) to review them before I put them on the blog. 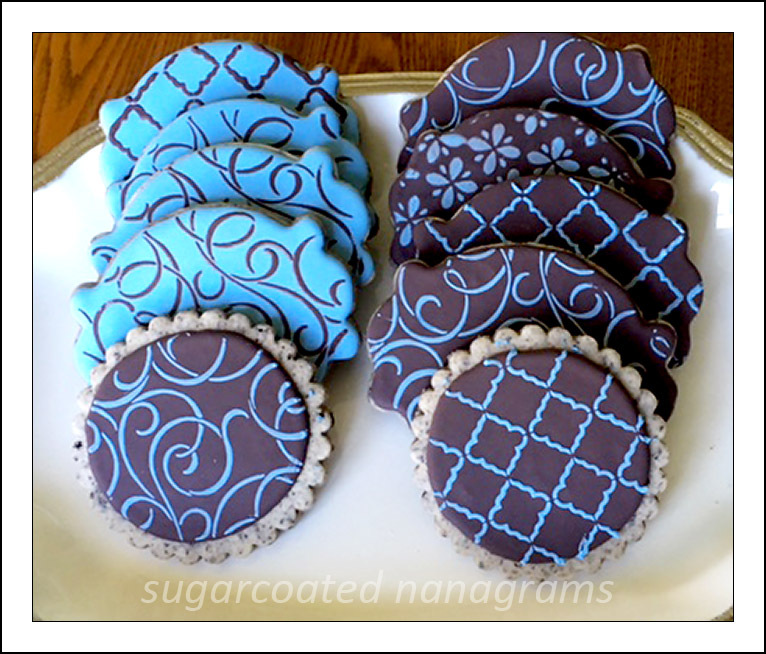 The brown iced cookies have chocolate royal icing on them, and the blue ones have regular royal icing. Some testers preferred the chocolate iced cookies and some preferred the plain ones. To make chocolate royal icing I added 1/2 cup of good quality cocoa powder to my regular royal icing recipe. Either way, I don’t think you will be disappointed with this recipe. Like my regular sugar cookie recipe, this cookie does not spread and bakes true to the shape you cut out. Yield: Approximately 3 dozen cookies depending on size. Finely grind Oreos. I used my Cuisinart. Mix butter and granulated sugar until thoroughly blended. You don’t need to “cream” your butter and sugar. The more you mix your dough at each stage the more your cookies will spread while being baked. Add eggs and extract. Mix well. Add flour and ground cookies, mix until just combined. Do not over mix your dough. Separate the dough into 2 or 3 balls, flatten and wrap in plastic wrap. Refrigerate for 3 hours or overnight. The dough can also be frozen at this point. Defrost it in the refrigerator. The dough will keep for a few days, in the refrigerator and several months in the freezer. Bake at 350 degrees for 10-12 minutes, until the cookies are slightly brown on the bottom. All ovens are different so keep an eye on your cookies the first time you make them to determine the best time for your oven. *Make sure you don’t over soften your butter. You should be able to make an dent with your finger when pressed but not so soft that your finger will go right into the butter. I have been trying quite a few gluten free recipes lately with mixed success, until today. 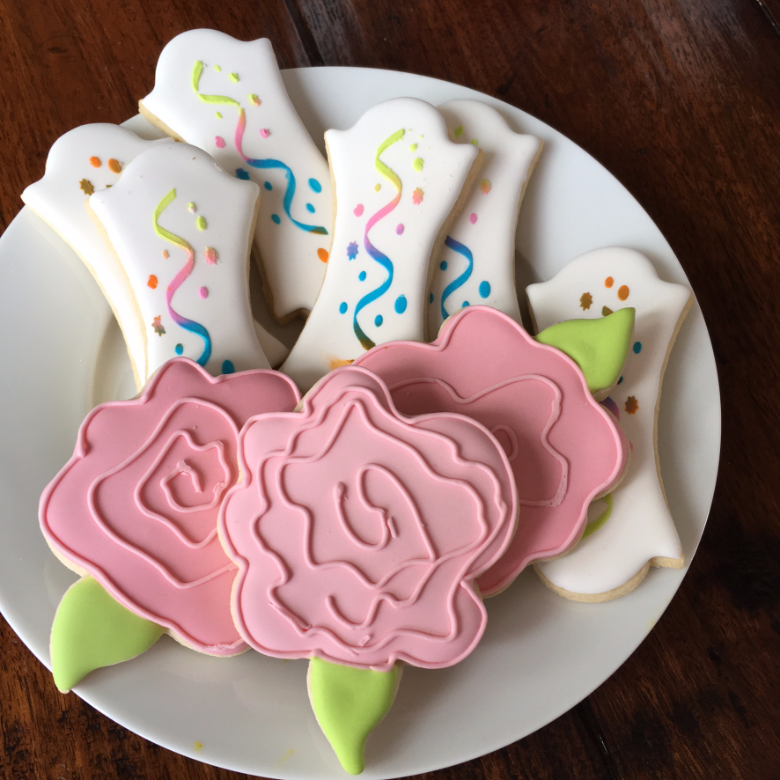 My granddaughter’s college roommate has Celiac Disease and I wanted to be able to send her sugar cookies when I send them to my granddaughter. I have made a couple of different gluten free cookies to send her, like oatmeal cookies and meringues, but never a decorated sugar cookie. I tried several brands of gluten free flour but none of the resultant cookies tasted like a cookie I would want to eat. I found a recipe for a blend of flours to use as a substitute, and tried that as well, but that wasn’t very tasty either. One day, I read a review of Namaste brand gluten free flour. All of the reviewers said it was the best they ever tried, so I decided to give it a try. Namaste flour acted just like all purpose flour in this recipe. My husband couldn’t tell the difference between the gluten free sugar cookie and the regular sugar cookie. When I make them for Mel, I am as careful as I can be to avoid cross contamination. The last thing I want to do is make her sick. If you want these to be dairy free as well, substitute Earth Balance for the butter in the recipe. It’s a fabulous substitute. I use it in my Vegan Cookies with great results. I hope you will try this recipe and please let me know if you like it! Mix butter and granulated sugar until thoroughly blended. You don’t need to “cream” your butter and sugar. The more you mix your dough at each stage the more your cookies will spread while being baked. Add eggs and extracts. Mix well. Add flour, mix until just combined. Do not over mix your dough. Separate the dough into 2 or 3 balls, flatten and wrap in plastic wrap. Refrigerate for 3 hours or overnight. The dough can also be frozen at this point. Defrost it in the refrigerator. The dough will keep for a few days in the refrigerator and several months in the freezer if well wrapped. *Make sure you don’t over soften your butter. You should be able to make a dent with your finger when pressed but not so soft that your finger will go right into the butter. **You may substitute any other flavoring you prefer for the lemon but don’t eliminate the vanilla. Be aware of nut allergies if you choose to use almond extract. ***This dough is stickier than some recipes. I roll my cookies out on a pastry cloth with flour so this recipe allows for some added flour from the rolling process. If you do not use flour to roll your cookies you may add an additional 1/4 cup of flour to the recipe.